This local historic district includes several parish buildings, including the church at 1515 Baldwin, the rectory at 1491 Baldwin, and the school at 1480 Baldwin. Charles Borromeo, born in northern Italy in 1538 to a noble family, was a leader of the Catholic Counter Reformation. He was related to the Medici family, and educated at the University of Pavia. When Cardinal Medici became Pope Pius IV in 1560, Borromeo was appointed to administer the papal land holdings in Italy. Thus began his administrative career with the Roman Church, one that continued until Borromeo’s death at age 46. At this time, the Church was attempting to react to the highly successful Reformation that Martin Luther initiated. The Council of Trent was intended to be a major step toward modernization of the Roman Church, but was suspended in 1552. As a Vatican administrator, Borromeo played a key role in getting the Council to resume their meetings in 1562. He was not only an administrator, but participated in their deliberations. In 1563, he decided to become a clergyman. He continued his rise through the administrative ranks, and was eventually appointed archbishop of Milan where he strove to carry out the reforms initiated by the Council of Trent. This included drafting a new catechism for the Roman Church, revising the Missal used for the liturgy, and drastically revising the bureaucratic administration of the church. Borromeo was extremely active in both the religious and secular activities of the Roman church during the controversial and conflict-filled years of the late 1500s. We seldom think about churches going out of business in the manner that Detroit’s once leading automakers have—Hudson, Hupp, Olds and Packard. But they can disappear or change drastically. The Eastern Orthodox Church split with Rome in the 1200s, a divide that persists. If Charles Borromeo and others had not led a counter reformation, it is possible that the Protestant faiths might have driven the Roman church close to extinction. Flemish immigrants—and Flemish priests—began arriving in Detroit as early as the 1830s, and by the 1850s, a Flemish community developed near the intersection of Baldwin and Gratiot on the east side. When Europeans came to Detroit in great numbers for industrial jobs between the 1880s and the 1920s, the Catholic diocese established dozens of new parishes, many of them targeted to the needs of a specific ethnicity, but established on extensive campuses such as this one. 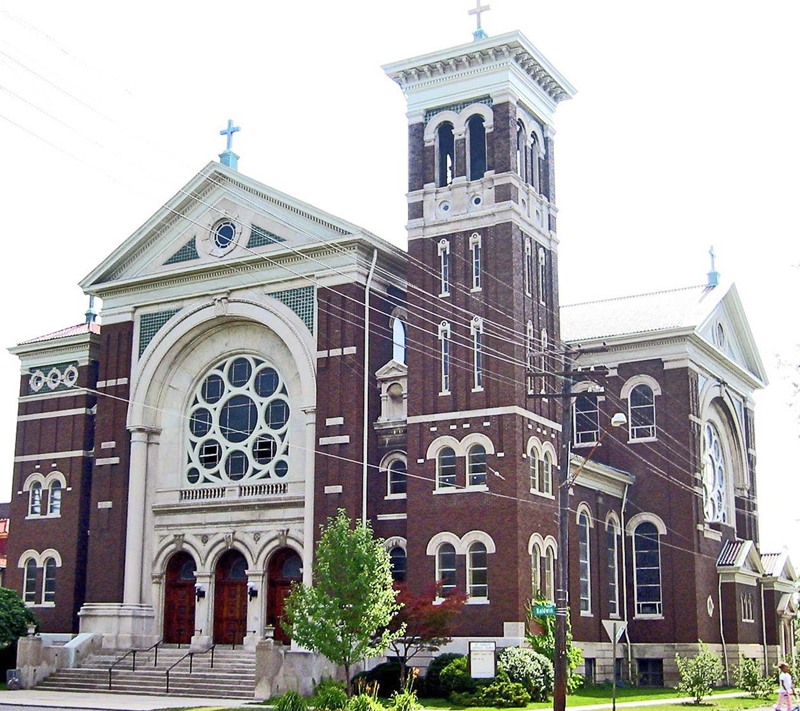 St. Charles Borromeo was created to serve the needs of Detroit’s Flemish Catholics in 1886. A small frame church was built near the corner of Field and Agnes, and then expanded shortly thereafter to serve the growing congregation. Apparently, the Flemish community moved east along Baldwin toward Jefferson. The parish grew in size, but quickly included French, German, and English Catholics. Land was purchased on Agnes between Baldwin and Townsend. Just before World War I, the congregation decided to build a large Romanesque church. They held an architectural comptetion and the chosen design was that of Detroit church architect Peter Dederich who’s most frequently seen and appreciated accomplishment is St. Mary’s Church, thanks to its location adjoining the Greektown casino and Greek restaurants on Monroe. The classical cruciform church that you see is a red-brown brick structure sitting on a highly visible limestone foundation, with extensive trim in white Bedford stone. Green tile decorates the exterior, giving the church a warm, pleasant appearance. Not surprisingly, a classical rose window is above the impressive triple-arched entrance. The Arts and Crafts movement strongly influenced Detroit designers in the World War I era. Here you will see both egg and dart and bead and reel decorations. The more time you spend looking at this building, the more embellishments you see, suggesting that Peter Dederichs must have enjoyed himself immensely when he drew plans for this church. Notice also, the unequal towers at the Baldwin Street entrance with their red tiled hipped roofs. Just six years after completion, the church was expanded to meet the need for more room for this growing congregation. This campus—and the City of Detroit Local Historic District—includes a rectory and a school that were completed seven years prior to the church. These were designed in the Prairie style with some Byzantine elements.